Felix Bürkner – classically correct in ‘fancy pants’. The occasion: A costume ball in the 1920’s. Image courtesy of equivox.de. This headline appeared in social media this morning, linking to an article by a British horse magazine. Below it, a young rider in a purple dressage coat, lavender pants, horse decked out in matching colors. Frankly, I don’t remember what exactly the horse looked like, apart from the colorful accessories. Now, thinking about that question again, all I remember in my mind is the rider’s flamboyant outfit. Reading through the ‘yeah’ and ‘nay’ comments and opinions of others, I simply can’t come up with an intelligent answer, in spite of sipping on a decaf soy latte. But, wait a minute… Is this even the right question to ask? Whenever there is the need for analysis, there is a need to ask the right questions and confirm the definition of the substance at stake (IT project managers will agree here). In other words, if we want to determine whether a change needs to be made, let’s make sure we are all talking about the same thing. What exactly are we talking about? DRESSAGE, you will say. And where do we find the correct definition? This makes a lot of sense. So Dressage is a means to an end, not an end itself. Horsemen, mostly in the cavalry, culminated practical knowledge over centuries, learned what works and what doesn’t when it comes to creating an able and willing equine partner, documented this and it in the form of an Army Regulation. Aha! So the goal is to create an willing and able equine athlete, who will stay healthy and usable for a long time! In 2015 speak: ROI (Return On Investment), folks! 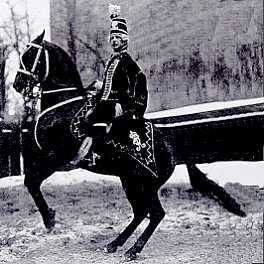 In the context of preparing the horse for a partnership in military service (end), dressage was the systematic schooling (means) needed to create this able military steed. Not an end in itself. Dressage competitions, in turn, are merely benchmarking events. Here is where riders show how far they have come in their schooling of their horse, here is where this schooling is judged not against the performance of other riders, but according to the governing parameters: the Principles of Riding (based on the HDV12). We asked the question: What are we talking about? What is dressage? We discovered the correct definition of dressage as a systematic schooling of the horse to create an able and willing all around equine athlete. Dressage competitions are benchmarking events, where we are judged against the ‘rules we ride by’, which are the FN Principles of Riding (based on the HDV12). The ‘makeover’ question raises a lot of other questions in my mind. Why do we need mass audiences? Why does dressage need to appeal to mass audiences? Who benefits from making some of the proposed changes or even making these concerns priorities? Are you or are you not basing the rules we ride by on the classical guidelines (HDV12)? ← World Leaders on Horseback~ Happy Presidents Day to My US readers!